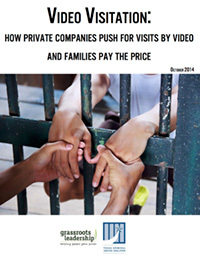 Download the PDF version of "Video Visitation"
In September 2014, a group of Dallas-area advocates led a fight against an initiative that would have introduced video visitation capability to the Dallas County jail. The company proposing to provide services to Dallas had buried in its contract a requirement that the jail eliminate in-person visitation, thus leaving those who wished to visit prisoners only one option – visit by video. Or, don’t visit at all. Dallas officials voted the proposal down, but it was the latest front in a battle that has seen video-only visitation policies spreading across the country, primarily in local lockups. Embraced by jail officials as a way to alleviate what many see as the burdensome security aspects of prison visitation, the primary attraction of video-only visitation actually rests on one facet: money.